"Sampath Speaking" - the thoughts of an Insurer from Thiruvallikkeni: Cristina re-elected – landslide victory in Argentina…..
Cristina re-elected – landslide victory in Argentina….. The President of India is the head of state and first citizen of India, as well as the Supreme Commander of the Indian Armed Forces- but most of the authority vested in the President is in practice exercised by the Council of Ministers, headed by the Prime Minister. The 12th President of India is Her Excellency Pratibha Devisingh Patil, the first woman to serve in the office, who was sworn in on 25 July 2007. Going by the Article 58 of the Constitution, the principle qualifications of eligibility are : citizen of India, of 35 years of age and qualified to become a member of Lok Sabha. Argentina is far away situated in the South America – a federation of 23 provinces and an autonomous city, Buenos Aires. It is the eighth-largest country in the world by land area and the largest among Spanish-speaking nations. The President of the Argentine Nation usually known as the President of Argentina, is the head of state of Argentina. Section 90 of the Argentine Constitution establishes the requirements for becoming the President. The President must be a natural-born citizen of the country, or have been born to Argentine citizens if born abroad. Under the 1994 constitutional amendment, the President serves for four years, with a possibility of immediate reelection for one more term. After serving for two consecutive periods, the president is not allowed to run for a third consecutive one, but may return for the two following elections and so on. 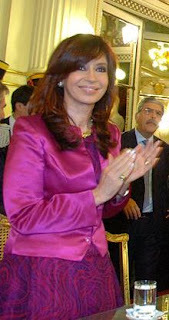 Néstor Carlos Kirchner had a very rare honour – he was the President of Argentina and in Oct 2007, his Cristina Fernández de Kirchner was elected to succeed him as President of Argentina. Thus, Kirchner then became the First Gentleman of Argentina. He passed away in Oct 2010 due to ailment. Cristina, a fashion icon for women, was the first elected female President of Argentina. Besides she has been a notable advocate for human rights, poverty awareness and health improvement. The first elected female President has won again - Cristina Elisabet Fernández de Kirchnern, 56, has been re-elected with landslide margin.. A native of La Plata, Buenos Aires, Fernández is a graduate of the National University of La Plata. During Kirchner's presidency (2003–2007) she acted as First Lady. Quite vociferous, she in her address to United Nations in Sept 11, supported the requests from Palestine to have a seat in the United Nations, blamed Iran for the 1994 AMIA bombing and threatened to cancel the flights from Chile to the Falkland Islands, in order to advance the Argentine sovereignty claims over the islands. Now there are reports that the fiery president Cristina Fernandez has scored a record election win after her government spread the wealth of a booming economy. She obtained 53 per cent of the vote after 58 per cent of the polling stations reported nationwide. Her nearest challenger got just 17 per cent. It was the widest margin of victory in the country's history. Cristina Fernandez has made no secret of her contempt for Britain's presence in the Falklands Islands. Few months ago, she called Britain a 'crude colonial power' after David Cameron declared the Falkland Islands should remain British territory. She said Argentina intends to keep raising its demands in international forums for negotiations with the British. Most voters polled beforehand said they wanted government stability to keep their financial situations improving in what has been one of Argentina's longest spells of economic growth in history. An eminent economist Mark Weisbrot is quoted as stating that Argentina's world-record debt default in 2001 closed off most international lending, but it has kept the country booming ever since, with its economy expanding at twice the rate of Brazil's. Like many other countries, Argentina faces tough challenges in 2012 with its commodities exports becoming vulnerable to a global recession, and economic growth is forecast to slow sharply in the coming year.